CR80, CR90, CR100 international standard size plastic card Is mainly used for card printers, can print pattern, LOGO, portrait and so on. 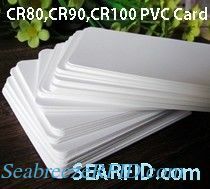 CR80 PVC card can also encapsulate RFID chip, magnetic stripe, etc all kinds of production process. Chip: MF1 IC S50, MF1 4K S70, Ultralight 10, Ultralight C, I CODE SLI/SLI-S/SLI-L/SLIX, Desfire2K/4k/8K, Ti2048, EM4102, EM4200, EM4305, TK4100, T5577, Hitag2, FM11RF08, Alien H3, Impinj M4, etc.